When I read a book the most important thing to me is to see the characters come to life – to learn about what those people may have actually been and how they interacted with others. 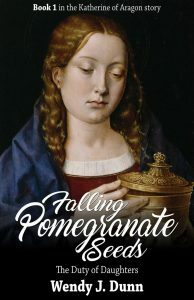 In this book, “Falling Pomegranate Seeds,” we learn not only about Katherine of Aragon, who going forward we’ll refer to as Catalina, but also her closest friend Maria de Salines. Maria was with Catalina from childhood – they shared a tutor, Beatriz, who is the true focus of this book. I was pleasantly surprised to have the story be told by the tutor, but to be honest, she was the perfect person to talk about the life and family of the infanta Catalina. Beatriz, by association, would have been present all the major events. Did I mention that she also had a great relationship with Queen Isabel? 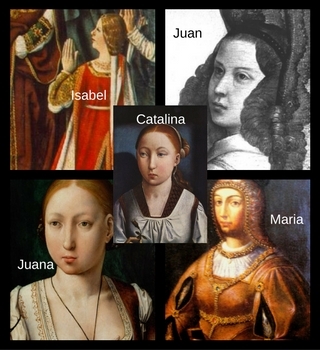 In the story we meet Catalina’s siblings, Isabel, Juan, Juana and Maria. We learn that Isabel was the oldest child and was the only child for roughly eight years before Juan was born. Isabel eventually married a man she loved from “long” ago and is madly happy until he dies unexpectedly. Isabel is crushed from the death and does not wish to continue living. 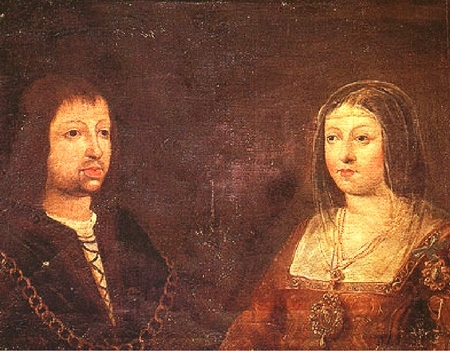 Wedding portrait of King Ferdinand II of Aragón and Queen Isabel of Castile. From birth Juan was sickly, and this is something that doesn’t change with time, however he does find great love and the possibility of a great future. He’s a great musician and very sensitive to his sisters, especially when he attempts to comfort a grieving Isabel. Juana, we now know as Juana “the mad” and the most sensitive child of the five siblings. Juana’s mother, Queen Isabella does a great job at protecting her daughter from the wrath of her father, Ferdinand of Aragon – who we find out does not like Juana. You’ll have to read the book to find out why. Maria I feel like I don’t know much about, and I’m honestly okay with that. She was a more silent character in the story – which with so many interesting people to write about I don’t blame the author one bit. Over-all the story fills me with happiness – to see the love that Queen Isabel had for her children is heartwarming. She saw it as her responsibility to protect her children, especially Juana who seemed to need it a little more than her siblings. We see the sadness that these people lived through, whether it be the loss of a child or a loved one; It was as painful to them as it is today. We see how being a servant rarely offered you a voice when you had been taken against your will by a man more powerful than yourself. And you get to see young love and happiness – the part that may have brought me the most joy of all. As a princess or infanta your life was planned for you. This is something that the author does a great job of showing in the book. You may be a royal but you do not have a say to who you marry or where you go. The duty of daughters. I would highly recommend this book if you are interested in the life of Katherine of Aragon. 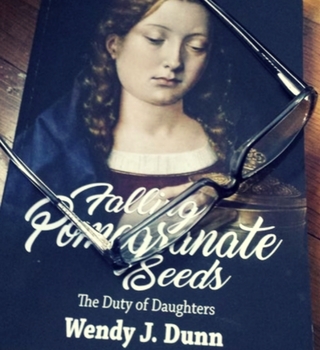 Author, Wendy J. Dunn did a magnificent job at researching Katherine and her family to give you a better idea of why Katherine became the queen we have learned to love. Catalina: Wikipedia – Portrait by Juan de Flandes thought to be of 11-year-old Catherine. She resembles her sister Joanna of Castile. The author apparently went too far with her assumption that Ferdinand disliked Juana. The chroniclers of the time say Ferdinand had a cute nickname for Juana, calling her jokingly “mother” because she looked just like his beloved mother, Juana Enríquez. Also it is said every time Juana saw her father coming from trips, she would forget the etiquette and throw herself at him, which she would not have done if he had disliked her. Their relationship got worse much later and not only Ferdinand’s with Juana but also Juana’s relationship with her mother. Isabella says so herself.